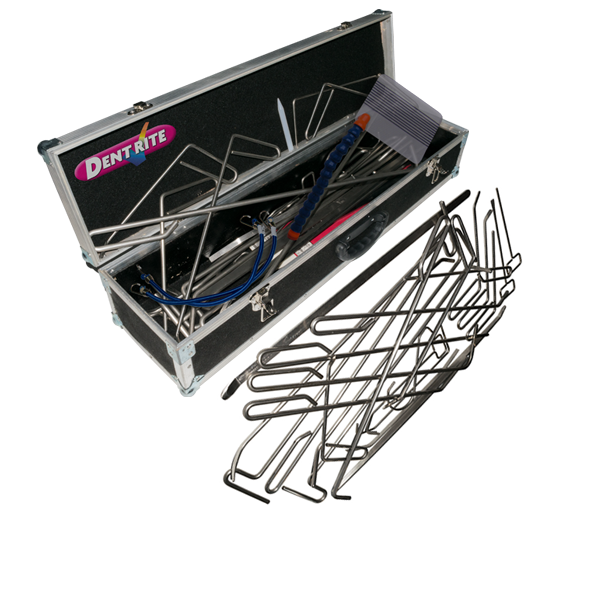 The "Dentrite" system is undoubtedly the best Paintless Dent Removal (PDR) Kit on the market, comprising a comprehensive 32 piece kit of high quality polished stainless steel rods, carrying case and ancillary products and will cover all your requirements when repairing minor dings and dents on ALL 'metal' vehicle panels. Whether you are working in the retail or trade markets, or even both, the DentRite PDR kit offers you a chance to fulfil your earning potential. The PDR tools work by massaging the back of the dent until it regains its previous shape. This technique produces unbelievable results and saves your customer paying out for body shop repairs. Each of our PDR tools are specially designed in size, angle and thickness to tackle a variety of dings and dents in even the most awkward areas. Along with this fantastic product, you will also receive FIVE full days of training at our state-of-the-art training facility in West Yorkshire, UK. For more information about our Dentrite Repair Kit click the button below to download the print friendly PDF brochure, or if you would like to receive a quote for this kit, please click the request a quote button.